Unique, artistic, deep and soulful; these are all appropriate descriptions for how Los Angeles DJ Terence Toy approaches his craft and how he has made a prominent name for himself throughout California, across the country and abroad. He started spinning house tracks back when the genre was progressing through major east coast cities with velocity. The late New York house DJ David Bryant was a mentor to Terence and turned him on to the deep, funky sound of the underground scene. Every week Bryant would go to the record store and buy two copies of whatever DJ Larry Levan (of New York’s famed Paradise Garage) had most recently spun and send Terence copies. He was hooked after only a few tapes came his way and started mixing all the new beats he could find. Bryant’s perceptive advice to Terence was, “to be really successful in this business, these are the grooves to play”. Terence never looked back. To the benefit of his audience, Terence brings to his turntables the experience of being a trained musician. With weekly lessons for almost 8 years, he’s a skilled drummer. He also reads music and was a member of his high school band. His musical background has really paid off, as he understands music theory and is an expert at reconstructing verses, bridges and breaks. He is also an accomplished composer and producer of house music, including deep house, R&B house, gospel house, Afro-Cuban rhythms and Afro-tech. For over twenty-five years Terence has cultivated his own unique hybrid of styles, rich with soulful melodies, uplifting harmonies and penetrating beats. Toy masters the art of building a rapturous experience on the dance floor and skillfully teases it out; intensifying tempos, deepening grooves, rising to a plateau, music and dancer are flowing in responsive communication. Fix yourself on this level of reciprocity with Terence for a while, get loose, greater is definitely coming. With masterful mixing, he escalates further your vibrational nocturnal journey to a rich crescendo that will have you speaking in House. Make no mistake – devotees know what they’re going to get! Terence is widely recognized for helping to popularize house and club culture up and down the California coast and for the musical support of numerous gold and platinum selling artists, among many others. Toy has a strong connection to the world of art through specialty designer fashion and live, runway shows and enjoys sponsorship by several LA-based apparel lines. Most recently he DJ’d a designer fashion show at the grand opening of the A. Macy Art Gallery in L.A. Club-goers will often see him characteristically arriving to his events dressed in stylish and original attire, setting the mood for an elevated event experience. Terence, along with Refuge, envisions patrons of the club scene returning to the days of dressing up when they venture out. Refuge Recordings, a production and promotion company founded and run by Toy and partner Samuel Saunders supports most of Terence’s events. Their mission is to bring deep house to the masses. One very special occasion is the annual Christmas holiday ‘Terence Toy Drive’, where money is raised for different charities each year. The most current project is producing exclusive cover tunes for the label. To this day his favorite part of the gig is putting on that first song. This act holds the key for many of his expressions toward his audience and is first in a process of connecting with them. 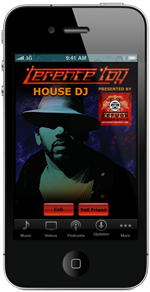 Come on out and take a trip with the extraordinary DJ Terence Toy! Terence’s latest CD is REFUGE 7, LIVE IN NOGALES AVAILABLE NOW.